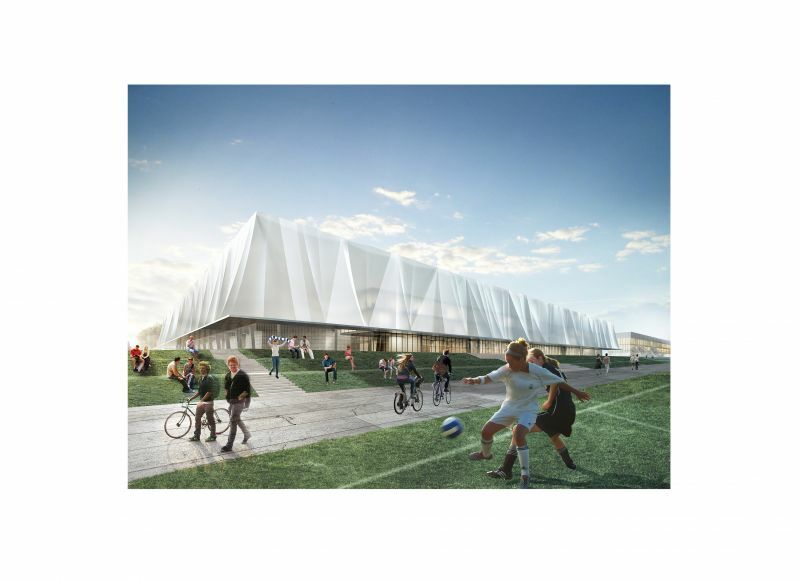 The results of the competition for the ?Development of an urban and architectural concept of the redevelopment of the Municipal Stadium in Olsztyn? were announced on 11th December 2015. The WXCA Team won a distinction! -Deputy Competition Secretary: Adriana Patalas (SARP architect, Olsztyn Branch). The urban planning concept requires the creation of links between the residential multifamily housing and the industrial zone of the Stomil Olsztyn plant through the creation of a new, multifunctional centre around the City Stadium. 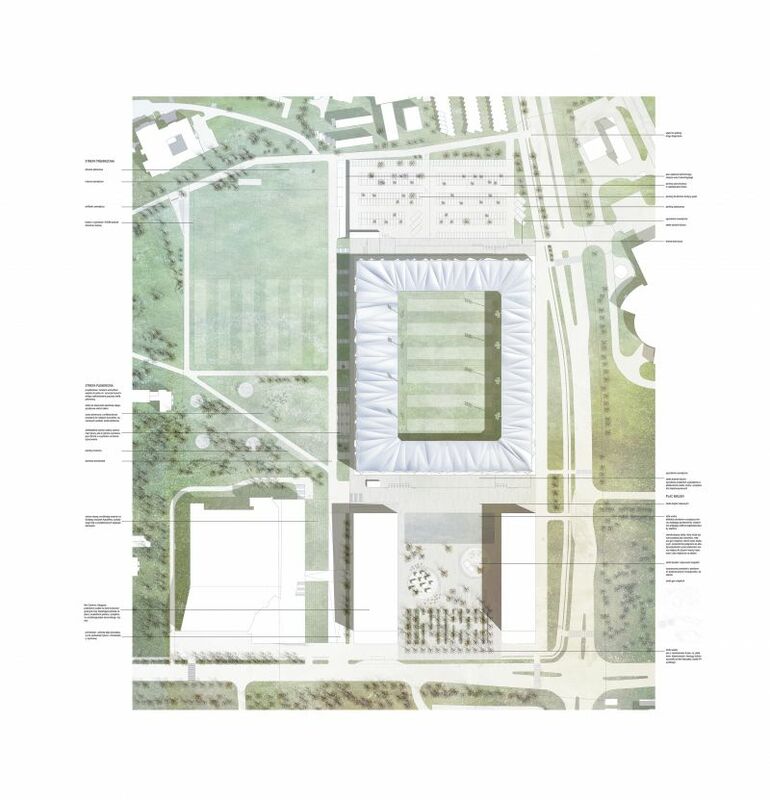 Exposure of the body of the stadium in the view from Marshall Józef Piłsudski Avenue was planned through the axial layout of the urban concept design. A utility city square was proposed from the south side. The body of the retail centre and hotel close the side walls of the square. Service and commercial space was introduced on the ground floors of the buildings, which allows for the creation of a city square that can function independently of the events being held on the stadium. The square starts with a rhythmic sequence of trees from the side of Marshall Józef Piłsudski Avenue. The central part of the square is occupied by an urban action and activity area. A delicate and smooth lowering in the floor has been planned further down the square, forming a water surface. Depending on the requirements, the water basin can also be transformed into a mass event space suitable for concerts or seasonal sports activities like an ice rink or volleyball courts. The pedestrian route for the participants of sports events that starts at Marshall Józef Piłsudski Avenue leads up to the Western Stand. The gently sloping ramp which used to extend into the promenade designates the borders of the two zones with the land level differences. The land level differences were designed as amphitheatre smooth stairs and outdoor stands that lead into the greenery of Janusz Kusociński Park. A training area was designed in the northern part of the area with a full-size football field, illuminated masts and artificial turf pitch. The service square and car park entrances were designed in the northern part from W. Leonhard Street. The City, as the capital of the Varmia region, evokes strong associations with the Lake District and sailing. 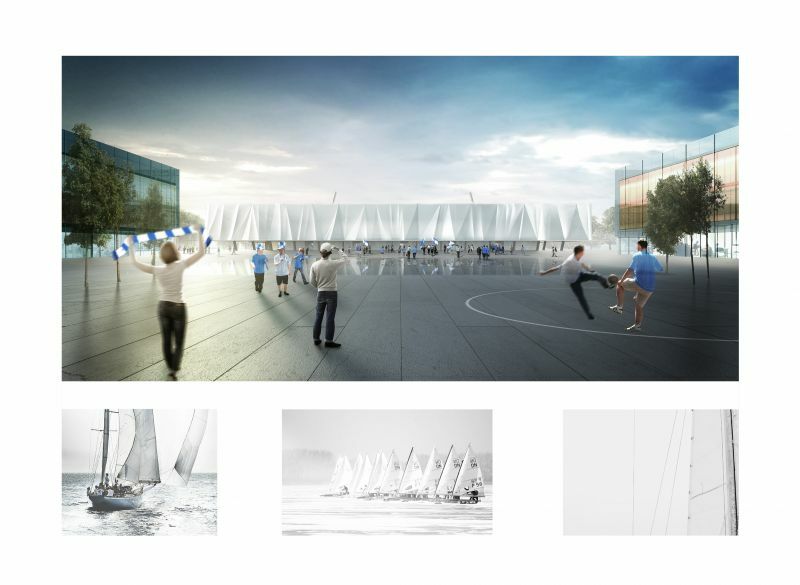 The form of transformed sails becomes the starting point for shaping the facade of the facility. The lightness of the white membranes, the cut panels and the whole dynamics of the composition evokes associations with the start of a regatta or the speckling of sailboats on the horizon. The water in front of the stadium reflecting the light and elevation planes further heightens the sense of lightness and associations with the landscape of the Masurian Lake District. The main objective was for the structure to seamlessly fit into the city. 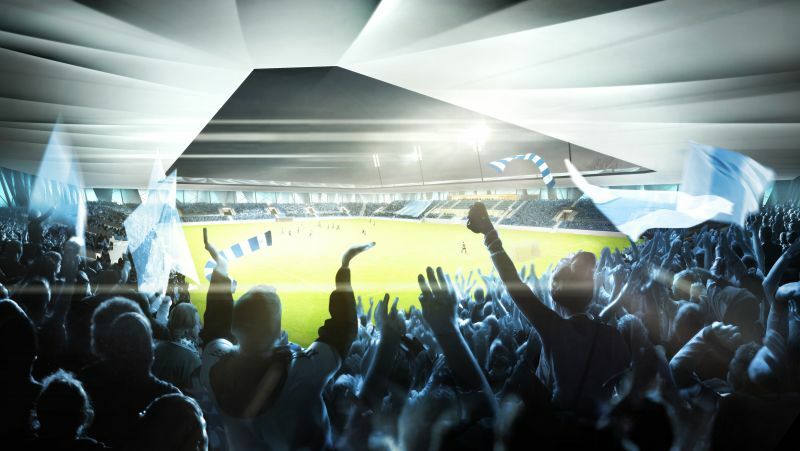 The new stadium was designed to be an instantly recognisable hallmark of the City of Olsztyn.